What is it about islands…? Just what is it about islands that authors, playwrights and poets are drawn to use them as settings for their works? Especially crime writers? I wrote an article on this very topic, which is now in The Island Review. 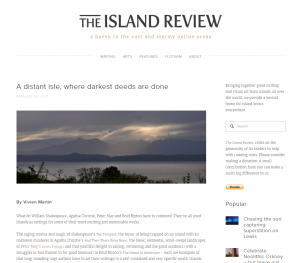 This entry was posted in History, Scotland, The Island Review, Travel, Writing and tagged Arran, Bute, Enid Blyton, Myra Duffy, Peter May, The Island Review. Bookmark the permalink.